Columnist Myles Anderson explores insights gleaned from a recent BrightLocal webinar on reviews and reputation management for local business marketers. I’ve recently been testing the opinions of local search consultants and agencies on the subject of online reviews and reputation. Running one poll to customers on our website (BrightLocal.com) and three others to attendees of a recent InsideLocal webinar has given me valuable insights into how search engine optimization (SEO) professionals view their online review strategies. My aim is to better understand what tactics are being used to generate online reviews. I also wanted to discover whether or not most SEOs have a clear review strategy that delivers ROI. Some Background: Why Online Reputation Is So Important! The management of a business’s online reputation is an important part of an effective local SEO strategy. Online reviews can affect your visibility in search engines and directories and help you to stand out from your local competitors. A positive reputation is also proven to convert more customers by inspiring trust through credibility. In Moz’s 2014 Local Search Ranking Factors survey, “Review Signals” such as quantity of reviews, star rating, velocity of reviews, etc., contributed a significant 9.8% to local ranking power. In other words, a positive reputation can help to put you in front of more consumers. Those local consumers are reading and using online reviews to decide which businesses to contact. Our 2014 Local Consumer Review Survey showed that 88% of consumers have read reviews to determine the quality of a local business, and 88% of consumers say they trust online reviews as much as personal recommendations. Do You Have A Review Strategy — And Is It Working? In our latest InsideLocal webinar — run in conjunction with the Local Search Forum — we polled the 272 attendees (made up of search consultants, marketers, and SMBs) about their review strategies. How much of your time do you spend on review/reputation-related tasks? 44% spend less than 10% of their time on review/reputation related tasks. 73% spend 0-20% of their time on review/reputation related tasks. Only 28% spend more than 21% of their time on review/reputation related tasks. The number of individual tasks that any SEO has to deal with on a weekly basis can easily hit double figures, so it’s unlikely that any one task will take up the majority of their time. With review signals accounting for 10% of local ranking factors, it correlates that most SEOs spend around <20% of their time on reputation-related tasks. Often the day-to-day responsibility for getting reviews sits with the SMB, not the consultant, unlike other tasks – e.g. citations, link building, on-site optimization. So much of this 10% is dedicated to setting up review strategies, training clients and monitoring the results to ensure the strategy is working. 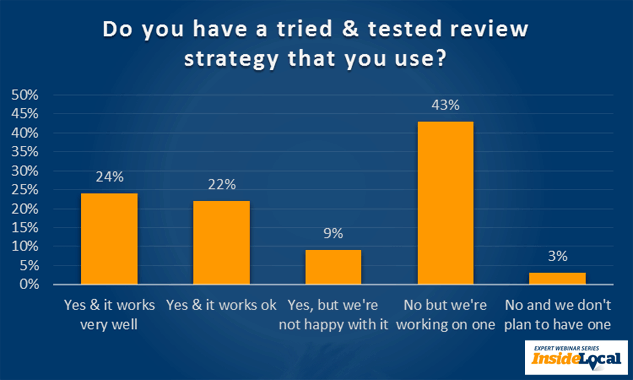 Do you have a tried and tested review strategy that you use? 55% of respondents do currently have a review strategy. 43% are currently working on a review strategy. SEOs understand that managing a business’s online reviews and reputation is crucial. We can see that the majority of those surveyed either already have a review strategy in place or are working on putting one together right now. During the webinar, panelist Phil Rozek made the astute point that, whether you like it or not, you have an online reputation. Businesses and SEOs can’t opt out — all they can do is decide how to nurture it. Do you think that reviews/reputation management delivers good ROI? 83% said that reviews and reputation management “absolutely” delivers a good ROI. 89% believe that reviews and reputation management delivers positive ROI in some form. The chart clearly shows that the majority of SEOs believe online reputation management has a very positive impact on the fortunes of a local business. The obvious benefits are improved ranking and higher conversion, but there are some less immediate benefits (such as impact on behavioural signals, which have a growing impact on local ranking) — and any edge that a business can get on its competitors is one worth driving after. Do you ever participate in any of the following actions to boost online reviews? 61% ask customers for reviews. 14% reward customers for reviews. 10% duplicate reviews on their own website. Of the respondents, 61% say that they ask customers for a review. This is often the simplest way of generating positive reviews, and it’s a strategy that is often encouraged by industry experts. In a post on the best practices for earning 5 star reviews, Thomas Ballantyne pointed out that a well-timed request can work wonders — it’s easy to ask for a review and get 5 stars if a customer is smiling. A few (14%) did reward customers for reviews. This is a practice that many search marketers steer away from because sites such as Yelp and Google+ will penalize businesses if they’re caught and remove their reviews. Considering the effort of getting those reviews, it’s not worth losing them and having your Google/Yelp profile hit just to get a few additional entries. That said, there are other sites that are less vigilant or fussy about incentivising reviews. Very few (<5%) claim to engage in more shady review generating actions. Faking reviews and syndicating the same review across multiple sites is bad practice and not advised. These 12 “nuggets of gold” come courtesy of the four expert panelists on the recent “Reviews & Reputation” webinar. These aren’t my own ideas, so I can’t take any credit for them — that belongs to Thomas Ballantyne, Phil Rozek, Aaron Weiche and Don Campbell. Huge thanks to them. 1. Google can’t take your reputation away from you. If done right, your online reputation is one of the few things Google can’t take from you. Phil Rozek pointed out that even if your website falls foul of an algorithm update, you still have your online reputation and reviews to convert the customers that do find you. 2. Lots of positive reviews = more clicks than your competitors. In addition to the obvious benefits of getting more clicks to your website, those clicks and conversions provide positive “behavioural signals” to Google, which gives further boost to your ranking over time. 3. Having no reviews can be as harmful as having bad ones. Don Campbell made a great point that if your business doesn’t have any online reviews, then you are very exposed. When you have no reviews, just one negative review can easily become the sum total of your reputation. That one review will act as warning beacon for customers to avoid your business, and that’s dangerous. Even if your business is the type that doesn’t naturally attract reviews, you need to go and get them so you don’t get caught by that one bad review. 4. A good review should be more than just an end-goal. Rather than thinking about how many good reviews you have, think, “How can we improve for our customers?” There’s no smoke without fire, and there are no positive reviews without a good, customer-oriented business. Aaron Weiche put it in plain English: It’s about letting your customers know that you are there to listen to them, that you care, and that you’ll do all you can to help them. That’s the hard part. The easy part is ensuring that you have a space on your site that enabled them to give their feedback. 5. Not enough businesses read & “mine” their own reviews. Here’s some low-hanging fruit from Phil Rozek: Reading & mining online reviews helps you gauge what the most common complaints are and how to fix them, but they are also a great source of new content ideas for your site. You can mine information from reviews, which helps you improve your service and write better blogs, which leads to more and better reviews (and more customers). 6. A good review strategy is an ongoing process. As Thomas Ballantyne pointed out, having 7-10 reviews might be an ideal start, but it would be foolish to stop there. If you have 10 great reviews from 10 years ago, then who cares? Obtaining positive reviews is an ongoing process, and you should never stop asking for reviews. Recency matters, so be consistent and constant with your efforts. 7. Make your review strategy part of your company culture. Those businesses who are best at reviews and reputation management are those that have it baked into their process. Aaron Weiche pointed out that whether you use a tool to help with the process or do it manually, it needs to be a priority for all staff. At Bulwark Pest Control (which Thomas Ballantyne works for), they go as far as to make reviews a deciding factor in staff career progression. Those with great feedback get ahead — those who don’t, or who just don’t care, are shown the exit! 8. Ask for reviews 1, 2, 3 times — don’t worry about being pushy. A lot of businesses don’t follow up on their initial review requests. Customers are busy people; even though they want to review your business, they may forget or run out of time. So don’t be afraid to remind them. Don Campbell shared some great stats from his work on GetFiveStars, and said that response rates to second and third review requests are higher than first-time requests. 9. Incentivizing customers to review? Do. Not. Do. It. As Aaron Weiche pointed out, delivering a great service every time should be incentive enough. Phil Rozek added that incentivized reviews are likely to be low quality, “thin” reviews that will get caught in review site spam filters and seem unnatural. Thomas Ballantyne went further to say that, if anything, offering an incentive for a customer to vouch for you can actually cheapen your relationship with a customer. 10. The best way to suppress bad reviews is to be proactive. Don Campbell reminded us that if you only have ten reviews, then one negative one is going to be amplified. For this reason, it’s important to get ahead of any potential issues before they arise. By implementing a proactive review strategy, you can ask customers for feedback and address any issues before they turn into bad public reviews. And if a bad review does get published online, then contact the customer and resolve their issues (or try to placate in them in any way you can). Once you’ve shown them you care, then ask them if they would revise their review. Even if they switch their 1-star review to a 3-star, that’s still a victory! 11. Niche review sites are huge! Niche sites may not have the audience volume to match the likes of Google+, Yelp, TripAdvisor, or Facebook, but those niche review sites are gold, says Phil Rozek. Sites like like Houzz, Healthgrades and Avvo are valuable sites for anyone operating in those industries. Consumers reading reviews on these sites are also likely to be further down the purchasing funnel and therefore more likely to convert. 12. Facebook fast becoming a force in online reviews. All of our panelists stated that they are seeing Facebook sneaking up on Yelp and Google+ as more customers leave reviews on Facebook. Facebook has a vast user base, and users are comfortable posting content on the site, so it feels easy and natural for them to leave reviews there. In addition to this, Facebook users are often already logged in, and leaving a review becomes a far simpler process. Don’t think of it as reputation management, but as reputation development. Your reputation won’t build itself –you have to take the reins and drive it forward.